Australian Tea Tree Oil and Lemon Peel Extract gently wash away excess oil and product buildup without stripping hair of its natural moisture. Organic Maca Root Extract helps strengthen and protect hair. With regular use, hair is soft, smooth and more manageable. This shampoo is gorgeous for oily hair.I like this shampoo. It smells terrific and is good for people with oily hair.When I used normal shampoo and conditioner I would wake up the next morning with oily hair.. With this I woke up the next day with soft clean hair, now I feel like I can actually wear my hair down! .This smells fresh and lemony, plus is made with organic ingredients and leaves my hair squeaky clean. It is a safe and good smelling product at a very good price. I have always been wary of using most Shampoo because my hair is so oily. I am now glad I took that chance! It works well with the Instant Relief Shampoo cooling and soothing my scalp, while leaving my hair soft and smooth without the greasy look. I will be using this product again without a doubt!Finally - a shampoo made for me. It works so well that I now wash my hair every second day and it always smells clean and looks fresh.worth buying like it very much. !Excellent Product - Highly Recommended! Love it! Noticed a difference with the first use. I purchased this shampoo for my husband as he has oily hair & he loves it. Lovely natural product with a nice light lemon scent, lathers great & controls the oil. 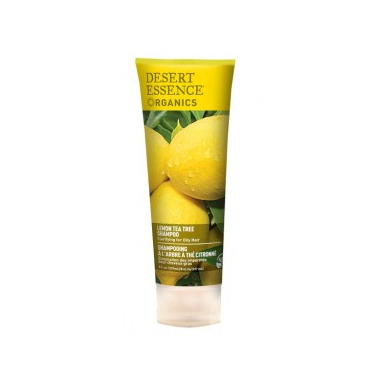 I love Desert Essence product range and price point, they are really very reasonable for a natural product. So far I'm happy with this line, but have only used twice so far. Smells great. The bottles last a really long time as well. I like the fresh lemon scent from this shampoo. I think it removes dirts and greasiness well but not as much as I expected. Great shampoo with a light refreshing scent. I have oily hair and I found this shampoo is great for not encouraging oil production. Hair feels clean but not a weird squeaky clean like regular shampoos. Love this product. I've been using it for a long time now. Perfect for long and short hair ! My daughter has greasy hair and flakes. This helps a lot and she loves the smell. I have thin, very greasy hair that looks unwashed less than 10 hours after shampooing it, but this shampoo has dramatically cut down the greasiness! I don't find the scent overwhelming or chemical-ly, it smells like lemon shampoo. Leaves my hair feeling clean and dries much faster too oddly enough. This shampoo smells like household cleaners. It doesn't wash properly my hair, I would need to wash my hair everyday. I'm giving two stars because it's organic. I don't like it. I really love this shampoo! I have oily hair and I could never find anything that would work, but this is perfect! It leaves my hair soft and shiny, and it smells like lemons! Absolutely amazing! I've been dealing with a dry scalp for a while. This shampoo/conditioner helps a lot. There's no build-up and it leaves your hair soft and shiny. Like previously mentioned, it smells like lemon cleaner (not bad, but not a typical shampoo/conditioner smell). I will continue to buy this product. My scalp is so oily I get pimples on my head at times, but this shampoo is great and I rarely get pimples. I have blonde coloured hair and it has not impacted my colour. I bought this on the recommendation of another dandruff sufferer, and while I still occasionally deep clean with a dandruff shampoo, this one more than pulls it's weight for the day to day. I've bought some for my brother who has psoriasis on his scalp and it's worked wonders as it's not so harsh as other treatments. Highly recommend! Love Love Love! Works as promised. I love all Desert Essence shampoos. This is more watery that the others but still great. I've noticed that my hair stays cleaner longer when I use this. Also, the tea tree smell is not overwhelming. Great shampoo. Foams well which most organic/natural shampoos don't, leaves hair feeling clean and really takes away grease. I have really oily hair and I find my hair stays cleaner for longer afterwards. Love this stuff. Very nice scent and need very little to get squeaky clean hair. Will work wonders for a teenage boys hair. Great shampoo. It really cleans hair and I find it even detangles my hair a bit so I don't need as much conditioner. Even cleans greasy teenager hair to make it look "fluffy"! I find this shampoo works better in the cooler months. In the summer, my hair gets greasy before the end of the day. But, it smells great and works relatively well. LOVE this shampoo. It does exactly what it is made to do and keeps oily hair shiny and silky while keeping the oil at bay. A great product that is well worth trying. I really love this shampoo. It has a great lemon smell, lathers well and a little goes a long way. My hair is clean without feeling stripped. I do have to wash my hair twice to get the lather, but love the shine it gives my hair. Love this product! It gives my hair a nice shine. Love this brand! This scent is a little dishsoapy, but it works great. Nice smell, miss having a lather but seems to still do a good job. This product is amazing! It smells nice, and makes my hair soft and healthy. The only downer is it doesn't lather :( but otherwise very nice. It smells nice (lemony) and it cleans well. Hair is more volumious after. It does a good job of clarifying, as well as removing excess oil. However, it being the almost the summertime with the hot, humid weather, the roots of my hair still tend to become oily by the evening so I use dry shampoo to lift the roots a bit. But the shampoo is pretty nice. This product works great on oily type hair. Im on my third container of it and it still works. As well, my hair is soft and shiny with the conditioner too. A must try if you cannot make it to the "second day" with out greasy hair. This shampoo lathers so nicely, smells great and will buy you an extra day with out having to wash your hair. Best shampoo for oily hair I have tried.